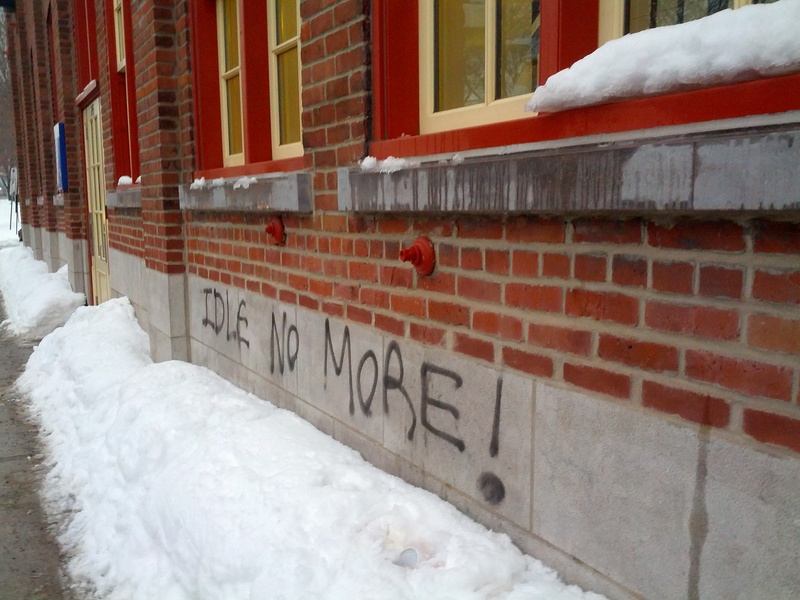 Idle No More is a movement that was called after the news circulated that First Nations leaders were denied entry to the House of Commons to discuss the federal budget bill. This bill makes sweeping changes to hundreds of regulations that will affect all Canadians and Indigenous people in particular. Born on social media networks, it calls for peaceful protests in towns and cities across Canada, and online. Resistance will take many forms. From mass rallies, protests outside politicians offices to Attawapiskat First Nation Chief Theresa Spence’s hunger strike, activists will challenge the decisions of our unaccountable and undemocratic government. When I say “our,” I refer to Canadians, descendants of settlers and for who, on this land, the current government is the only (federal) government we have. When Stephen Harper breaks his promises, lies about fighter jets or sells a part of Alberta to China, our political system works such that, while we may disagree, this government has been elected and they have the authority to pass this massive budget bill. We should voice our opposition and have a range of legal and less-than-legal options for how to do this. But for Indigenous communities, this relationship is different. The lies of the federal government aren’t part of the regular [dis]functioning of their government system. It’s a break in the legally-binding Treaties that were signed between national governments. When considered in these terms, the actions of the Harper government aren’t just another example of our broken democracy, it’s a break in the formal and legal responsibilities that the Crown has with Indigenous people. These responsibilities are the flip-side of the rights that the government seems to have no problem helping themselves to: access and exploitation of land and resources for example. But there are no rights without responsibilities and the current lot has shamefully ignored the “responsibilities” aspect of the Treaty arrangements. When Joe Oliver or Jim Flaherty refuses to meet with First Nations Chiefs in Ottawa, that’s a high insult. That is an action that signals that our government has no interest in meeting with the representatives of the people on who’s land we live, we pillage, we profit and we steal. Of course, this isn’t really new in the relationship between the Crown and Indigenous people. What might be new, though, is the nationally-coordinated, sophisticated response that will coalesce around Idle No More. Canadians: we have a responsibility to honour the Treaties, understand the Treaties and demand (vocally, physically, however we can) that our government honour the Treaties too. I’m sure that today isn’t going to be the last that we hear of Idle No More and I’m excited to watch how the campaign unfolds in the communities that I’m connected to. But, just as it will take unity and solidarity among First Nations people to fight for their rights, non-Indigenous activists have a role to play too. This is our government and we are partly to blame for allowing the current pack of wolves access to the hen house. Don’t be afraid to make mistakes. Be humble. Walk softly. Be kind. Be bold.